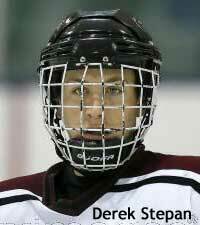 The Rangers selected high-scoring center Derek Stepan in the second round with their 51st overall pick. A natural goal scorer, the 6'0-168 pound Minnesota native scored 41 goals in 63 games last season for the vaunted Shattuck-St. Mary's high school hockey program that produced Sidney Crosby, Zach Parise, Ryan Malone, and a number of other NHL players. Stepan "has excellent offensive instincts and big-time scoring potential," according to THN, "but is smallish and must get stronger in order to maximize his upside. [He] projects as a top-six forward in the pros if he can improve his play without the puck." He will be attending the University of Wisconsin in the fall. Derek's father Brad was drafted by the Rangers 91st overall in 1985 but only got as far as the IHL Denver Rangers. Jared Staal, a player Ranger fans had their eyes on, was selected two picks earlier in the second round by Don Maloney in Phoenix. For more on Stepan, see his profile at NHL.com. You're gonna have to trust Gordie Clark on Michael Del Zotto -- and he even said as much. The Rangers' first round draftee impressed him most with his hockey sense, even as other scouts were knocking exactly that. The bottom line for Clark is that he believes he got the prototypical NHL defenseman of this day and age with a set of skills and smarts who can be taught to play defense and is not as bad of a skater as some say. Quotes from Clark can be read in articles filed by the reporters on site in Ottawa from the Daily News, Post, Newsday, and NYR.com. For more, see the Journal News, Blue Notes, MSG.com, and Prospect Park. We have winners in our Blueshirt Bulletin Draft Day subscription giveaway. We didn't reach subscriber #6666, falling about twenty subscriptions short. But in the other three catergories -- new subscriber and subscription renewal since the end of the season plus one other existing subscriber, the winners are: Bernard Landry of Dieppe, New Brunswick in Canada, Diane Martin of Deer Park, New York, and Ken Hamlet of New York City. Bernard and Diane, having taken out 30-issue subscriptions, get free lifetime subscription extensions plus a Blueshirt Bulletin T-shirt or Mark Messier bobblehead. Ken, having taken out a 20-issue subscription, gets a free one-year extension and a shirt or bobblehead. Congrats to the winners and thanks to all who participated. The Rangers selected Russian forward Evgeni Grachev 75th overall in the third round. The 6'3-200 pound center has some skating issues which may make him more of a power wing prospect than a pivot should he succeed in reaching the NHL level. "Evgeny is a power forward with a good physical presence and ability to come up with the puck in traffic areas," NHL.com says of Grachev. "He displays strong puck skills and the ability to make plays all over the ice, but needs to improve his acceleration and overall speed." 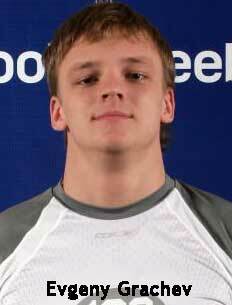 Grachev told RussianProspects.com about his experience at the NHL Combine. He said he was interviewed by twenty NHL teams and listed the Rangers as one of six teams that impressed him. He said that the Islanders were one team that spent more time with him than the customary fifteen minute interview -- yet the Isles, with three third round selections prior to the Rangers', chose other players. A native of the city in the far east of Russia that produced Alexander Mogilny, Grachev played with fellow Ranger draftee Artem Anisimov at Yaroslavl-2 in 2005-06, Anisimov's drat year. Grachev "is a tempting project prospect due to his size, physical presence and offensive skills," says RussianProspects.com, who believed he was a possible wild card pick late in the first round or early in the second. ISS had Grachev listed as their #24 prospect -- immediately after their #23 guy, Michael Del Zotto! He was CSS's second ranked European skater in mid-season behind Nikita Filatov but fell to #9 at the end of the season. Red Line Report ranked him #34. THN had him at #74, but nevertheless had good things to say about him: "He has the size all scouts love but it is his supreme skill level that could make him one of the sleepers of the 2008 selection process. Can play either wing position. Has already expressed interest in moving to North America early, so he may play in the CHL in 2008-09." The Rangers pulled off a pair of trades to acquire their next two picks. They traded Alex Bourret to Phoenix for the 90th overall pick late in the third round, and they traded with Nashville to get their own fourth round pick back (the one sent to St. Louis for Christian Backman) -- Nashville got the Rangers' seventh round pick (#201), plus a fourth round pick next year. The trade of Bourret represents the Rangers giving up on the former Atlanta first round draftee acquired at the 2007 trade deadline for Pascual Dupuis and a 2007 third round draft pick -- Bourret showed up at camp having improperly trained over the summer and showed inconsistent performance and work ethic last season in Hartford. With that additional third round pick, the Rangers chose Czech defenseman Tomas Kundratek, CSS's 12th ranked European -- the highest ranked Czech player in a down year for Czechs. The 6'1-185 pounder played 21 games in the Czech Extraliga last season for Trinec, including seven in the playoffs. His stock dropped after a lackluster performance at the World Juniors. "He has some offensive potential, sound instincts for the defense position," is about all we could find on this little-known player -- hopefully the guy who knows him best is the Rangers' scout in the region, Jan Gajdosik. With the fourth round pick, the Rangers selected Dale Weise, a 6'2-200 pound winger who will turn 20 in August. He was passed over in the past two drafts, but added goal scoring to his repertoire this season, leading Swift Current of the WHL with 29 and probably catching scouts' eyes with seven goals and 13 points in 12 playoff games. Prior to finding his scoring touch, he was primarily known as a hitter and fighter. With their last two picks in the draft, the Rangers chose a pair of players from Canada's major junior leauges. In the fifth round, center Chris Doyle of the PEI Rocket was the choice. The speedy 6'0-193-pound point producer -- 63 points in 63 games -- was a Rocket teammate of the Rangers' second pick last year, Antoine Lafleur. Ranked as high as #50 by Red Line Report (far lower in every other list), Doyle has been plagued by inconsistency. "Has two-way potential," says THN, "but must play with greater consistency -- both with and without the puck -- in order to maximize his value as an NHL prospect. Needs to add bulk so as to become a better pro." Read more about him here. In the sixth round, the Rangers selected defenseman Mitch Gaulton, who could be a steal -- THN had him ranked #54 overall. But he has to rebound from an elbow injury that cost him most of last season with the last place Erie Otters of the OHL (read about it here). "The 6-0, 210 pounder has a lot of lower-body strength, which helps him play a physical game from behind the blueline," says THN "[He] also displays smart decision-making and enough puck skills to produce some points at the highest level. Is considered a draft-day wild card." Here's hoping the Rangers can make this wild card count. darn it ... I shall have to do something I normally don't do and that is REPOST ... Jess? You jinxed me! Center. Shoots Right. 6'0", 168 lbs. Born: Hastings, Minnesota, USA, June 18, 1990. · Will attend the University of Wisconsin in the fall of 2008. · His dad, Brad, was selected 91st overall by the New York Rangers in the 1985 NHL Entry Draft – he played in the OHL for Sault Ste. Marie and Windsor. · Patterns his game after Dallas Stars' Mike Modano – "I like the way he makes things happen and is just a natural goal scorer". · Played on his first hockey team with the Hastings Mites and credits his dad for having had the most influence on his career – "I grew up around the game and loved it". · Jumping rope is part of his pre-game routine and his most memorable hockey moment was winning the 2006-07 National Championships. · His nickname is "Dstep" and if he wasn't playing hockey he would be a tap dancer. · The most embarrassing song on his iPod is "Breaking Free" from High School Musical and the one thing he couldn't live without are his family and friends. · Scored the game-winning goal to help Russia beat Team Canada in round-robin play at the 2008 IIHF Under-18 World Championships. He finished the tournament with five points (2-3-5) in six games, helping Russia win a silver medal. "Evgeny is a power forward with a good physical presence and ability to come up with the puck in traffic areas. He displays strong puck skills and the ability to make plays all over the ice, but needs to improve his acceleration and overall speed." Evgeny Grachev is a tempting project prospect due to his size, physical presence and offensive skills. The young forward is an above average skater. Evgeni Grachev is a very promising prospect who would be a strong wild-card selection late in the first round or early in the second round. Sounds as though Petrov is already making big money in Russia. Prolly a good thing we didn't take him. offensive weapons to go along with that build. Defense. Shoots Right. 6'1", 180 lbs. Born: Prerov, Czechoslovakia, December 26, 1989.
for Team Czech Republic at the 2008 World Junior Championships. The Draft is a total crapshoot! To get worked up about it is silly IMHO. But, when it comes down to the staff that chose Girardi, Callahan, Dubinsky, Staal and with a VERY late pick, Lundquivst, who will I trust??? Hmmmmmmm, lets think about this. Do I trust NHL professional scouts (and I realize that different people were in on different players during the past few years) OR, do I get worked up about the opinion of a person who is an AMATUER and has an AMATUER blog on the internet? Hmmmmmmmm, let's see, what a tough decision. Not sure about you guys, but I am going to put my faith in the Rangers staff. They will have some hits and some misses as all staffs do, but I sure trust their professional judgment more than a blogger on the internet. The Rangers have done much better over the past 4-5 drafts because of Tom Renney. He "fixed" the problem, increased the size of the scouting staff and brought in better people. We are not perfect, but much better. So once again we wait to see. I wish we would have gotten Niemi. New pick Dale Wise. Any word? reports? I like what I'm hearing about Grachev. I guess we'll see in about 3 - 4 years just how good a pick he was. "He has the size all scouts love but it is his supreme skill level that could make him one of the sleepers of the 2008 selection process... may be the second-best Russian forward eligible for the '08 draft, behind Nikita Filatov, but rated ninth among International skaters in Central Scouting's final rankings... can play either wing position but projects mainly as a center in the NHL... has already expressed a lot of interest in moving to North America early, so he may play in the CHL in 2008-09.
WHO OR WHAT ARE THE RANGERS TRADING TO GET THESE PICKS?????? Is Prucha still with the team??? i've been watching the draft on NHL network and they have yet to talk about anything Ranger related. There's a Ranger blogger at the draft giving updates. "The Predators swung their third trade of the day sending the 111th pick to the NY Rangers for the 201st pick and the Rangers’ fourth round pick next year. So apparently thats how we got Weise. Not sure how we got Kundratek." 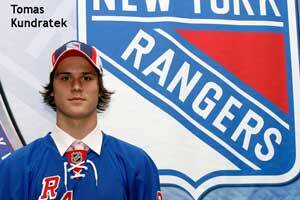 Rangers dealt Alex Bourret for the #90 pick. Rangers take Chris Doyle in the 5th, a point a game player in the Q.
Chris Doyle: Can't skate. That's it. Chris Doyle - He was okay..he was competitive. He's the "go to the net", third-line type. Chris Doyle F PEI - "I've been expecting a little more this season. I think he's come up a little short. You can't deny his talent. He can score as good as anybody, and he's got good hockey sense, but his skating's got to get better." So far, Doyle’s development has run from bantam in Charlottetown to midget AAA in Notre Dame Academy to a top-line forward spot on the Rocket to national play on P.E.I.’s men’s hockey team at the 2007 Canada Winter Games to an international stint as a member of Team Canada’s under-18 team. But becoming NHL worthy starts with the basics. “I have to work on my skating and be in the best shape that I can,” he said. Doyle has talked to a couple of NHL squads, but he wouldn’t reveal them. "The Phoenix Coyotes acquired right wing Alex Bourret from the New York Rangers on Saturday for a third-round pick in the 2008 NHL Entry Draft. With the pick, the 90th overall selection, the Rangers drafted defenseman Tomas Kundratek from Trinec of the Czech Republic. Drafted 16th overall by Atlanta in 2005, Bourret was obtained by New York in February 2007. The 21-year-old spent last season with Hartford of the American Hockey League, recording nine goals and 24 assists in 54 games. A native of Quebec, Bourret has yet to make his NHL debut." Bourret was terrible. He was never going to make this team. As always....interesting day. Does not look like we reached much, which is good. Added a d-man with a ton of potential, finally picked a big winger, a Russian and Czech. We might have a Russky line in a few years with Anisimov, Cherepanov and Grushev. As always, we'll see. Wish we would have traded Bourret for the rights to Staal. I have very mixed feelings about trading Bourret. On one hand, he had a terrible, terrible season in Hartford this season. On the other, he had more upside than most of the forwards there. But I'm not sure he's ever going to get his head together enough to become the player he COULD be. I LOVE the Grachev pick. Yaroslavl has a really good hockey school and a good track record for developing good, young players. They're not always the best about integrating that young talent into the big club, though, which is why Grachev only got into one game this season. Here's hoping they decide to be gracious again and let him come over before his contract is up (he's signed through 2011) like they did with Anisimov (who's still signed through 2010)! Not going to get into a fight over any of these picks so here it is what I know about them, take them any way you want. 4- Weise is a work in progress, very physical who loves contact, has to stay healthy which is why he fell to the 4th. Swift Current is on the rise so Weise will be expected to have a big season. 6- Gaulton missed most of the season due to a dislocated left elbow, has skill but if anyone says what kind of player he will become they are crazy because nobody really knows. Does not have a strong supporting cast as Erie is a tough place to play hockey in the OHL as it is hard to attract players willing to play there. The expectation with the PTA is that the NHL wants to go back to the old days where the rights to a European does not expire. As for Bourret, there is talent that has gone to waste. No matter what they tried to do nothing sunk in so Maloney wants to try again. Lajunen is not ours...he went to Nashville. There seems to be some confusion, but NYR.com does not have the Rangers with a 7th. I missed that thanks, I just refreshed and saw that as well. The Rangers always make some strange picks don't they. Drafting guys who are poor skaters is never really a good idea and there seem to be two or three here who have that knock on them. Remids me of the year they drafted several stiffs from the Green Bay Gamblers. Rangers seem to love Euro D and American High School kids going to College. Only time will tell, but this is not a draft that gets me excited. Bring on Mats Sundin! The Rangers always make some strange picks don't they. Drafting guys who are poor skaters is never really a good idea and there seem to be two or three here who have that knock on them. Reminds me of the year they drafted several stiffs from the Green Bay Gamblers. Rangers seem to love Euro D and American High School kids going to College. Only time will tell, but this is not a draft that gets me excited. Bring on Mats Sundin! Stamkos , Taverse and Zotto all on the same team , wow lots of firepower !! Thats why Zotto is so skilled . Get excited , he will be taking over in Hartford then up to the big club . Defense is his downside , strange to have that with a defensman...oh well , im dissapointed we never got Staal . Best move made on Draft day ... Not giving up Dubinsky and callahan to un-proven draft picks!!! Rangers have a ton of players who will be better this year . With-out avery and Jagr the team loses alot of character and may to be going down , but then again this team is full of up-side . The new NHL is younger and faster and you need a good goalie . We have that. We have young Centers , wingers , defensemen and goalies. Greg -- Do you actually think that Dubinsky was a trade possibility? not really scinoc , i was just stating that sometimes keeping what you have is the best move you can make . Dubinsky should be un touchable , but then again Avery should be signed . has anyone noticed that on the rangers official site mentions nothing about both the bourret trade AND the tomas kundratek pick? even though I see the picture of him wearing the jersey and hat on blueshirtbulletin its like he doesn't exist on the official site. it says the rangers pick 5. wtf? also will SOMEBODY please explain why they haven't mentioned the andreas jamtin signing yet? Having the CAPTAIN un-signed still is absolutly insane . Last season 11 players were forming new bonds with different lines and chemestry was being made. Finally we were jelling , made the playoffs and didn't do too bad in there too. All theses young players drafted and young Rangers still in europe waiting to come ... wont do a Hill of beans this year for us!!! Nice to have all that hope , it's great ...but realize that we need those vets that are free agents . Sign the guy who gives us a better record with him than with-out him . Sign OUR captain . Tell Shanny ,something?...just get him sorted . This team with all the potential it showed last year with sick defensmen was unbelievable , ty Hank!! The Draft just makes us stronger ...Not signing our vets does not. You have to check out this website. You can click on "Previous NHL Drafts" dating back to 1980. I know we all have our Yearbooks, etc. But this is a quick snapshot of how interesting the draft is and like some are saying, "you never know." What is clear is that the Rangers 1st round drafting - from 1980 to 2004 - was absolutely atrocious! Besides the bad picks, look at those that they and others passed up on too. Just a quick mind-blowing summary. During those 24 years, 4 years we did not own a 1st round pick. So in 20 years we only produced: ONE star (Leetch) and FOUR serviceable NYR players (Patrick, Dahlen, Kovalev*, and Sundstrom)!! The 15 other picks either wore the jersey very briefly and did not pan out or never wore the jersey at all (which is the majority). What a brutal memory lane this navigation was! With Staal (2005) to the current draft, hopefully this incredible trend has changed. I remember last year, as soon as a pick was made, details on that player were on the ranger site within a few minutes.